Adm. Philip S. Davidson, commander of U.S. Indo-Pacific Command (USINDOPACOM), became the Navy’s newest “Old Salt” during an award presentation Oct. 22 at the Pentagon.The “Old Salt” award is given to the active duty officer who has held the Surface Warfare Officer (SWO) qualification for the longest amount of time. "It is a tremendous honor to receive this award. I have been fortunate to be part of this organization for more than 35 years, serving alongside a number of amazing men and women. The U.S. Navy Chief of Naval Operations Adm. The document presents Richardson’s priorities with four “lines of effort” to strengthen naval power at and from the sea; achieve high velocity learning at every level; strengthen our Navy team for the future’ and expand and strengthen our network of partners. It isn’t an earth-shattering document, and perhaps is most telling for what it doesn’t say, as opposed to what is says. 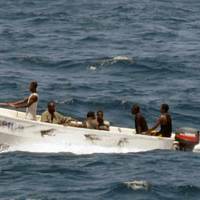 The document makes a strong case for forward presence, which has been the raison d’etre for the U.S. Navy for decades. “Members of the House Armed Services Committee are anxious to examine the details of the President’s defense budget proposal and get to work on the Fiscal Year 2010 defense authorization bill. In the current economic climate, it is more important than ever to ensure that each defense dollar is spent wisely and effectively. While many difficult budget and policy decisions are ahead of us, I believe the $533.8 billion requested for defense is a reasonable level which will allow us to support our troops and keep America safe. “I commend the administration for making service members and their families a priority in this budget. I am especially pleased that this year’s budget proposal does not impose new fees on the TRICARE health benefits our service members and their families need. The Navy will christen the newest Arleigh Burke class guided-missile destroyer, Dewey, Saturday, Jan. 26, during a 10 a.m. CST ceremony at Northrop Grumman Ship Systems in Pascagoula, Miss. Designated DDG 105, the new destroyer honors Adm. George Dewey (1837-1917) who commanded the Asiatic Station from the cruiser Olympia. Shortly after the onset of the Spanish-American War, Dewey led his squadron of warships into Manila Bay on April 30, 1898. The next morning, his squadron destroyed the Spanish fleet in only two hours without a single American loss. A widely popular hero of his day, Dewey was commissioned admiral of the Navy, a rank created for him, in March 1903. Two previous ships have proudly carried his name. WASHINGTON (NNS) -- Adm. Mike Mullen will relieve Adm. Vern Clark as the 28th Chief of Naval Operations during a change of command ceremony at the U.S. Naval Academy July 22. The ceremony will take place at the academy in Tecumseh Court, beginning at 10 a.m. Secretary of Defense Donald H. Rumsfeld and Secretary of the Navy Gordon England will deliver remarks. The ceremony will be broadcast worldwide via the Internet on www.navy.mil. By Mass Communication Specialist 3rd Class Michael A. Chairman of the Joint Chiefs of Staff, Marine Corps Gen. Peter Pace, visited more than 500 military personnel assigned to commands throughout the Pearl Harbor area Aug. 17 for an all hands call at Sharkey Theater on Naval Station Pearl Harbor as part of his tour of military bases on the island of Oahu. The visit was part of Pace’s tour of military bases to thank military personnel for all they have done during his 40-year military career. “I have come a long way to say what is most important – thank you,” said Pace. Through his hour-long speech and response to questions, Pace regularly spoke on his admiration for the men and women who serve the country and their role in how the country operates. “Your job is important. Chief of Naval Operations (CNO) Adm. Mike Mullen and Commander, U.S. Strategic Command, Gen. James E. Cartwright greet Sen. Joseph Lieberman, Sen. Jack Reed and Sen. John Warner prior to their confirmation hearing before the Senate Armed Services Committee for appointment to Chairman and Vice Chairman of the Joint Chiefs of Staff at Hart Senate Office Building. U.S. Navy photo by Mass Communication Specialist 1st Class Chad J. The Senate confirmed Adm. Michael G. Mullen and Marine Corps Gen. James E. “Hoss” Cartwright as chairman and vice chairman of the Joint Chiefs of Staff, respectively, Aug. Mullen will assume the top U.S. military post, held by Marine Gen. Peter Pace since September 2005. Pace is slated to retire Oct. Cartwright assumes the No. 2 military post held by Navy Adm.
Chief of Naval Operations (CNO) Adm. Mike Mullen testifies before the Senate Armed Services Committee during his confirmation hearing for appointment to Chairman of the Joint Chiefs of Staff at Hart Senate Office Building. U.S. Navy photo by Mass Communication Specialist 1st Class Chad J. McNeeley. By Mass Communication Specialist 1st Class Shane Tuck, Commander, U.S. Commander, U.S. Pacific Fleet Adm. Robert F. Willard presented a Meritorious Unit Commendation to his staff during a morning colors ceremony held July 27 at the Makalapa Compound here. On behalf of the Secretary of the Navy Donald C. Winter and Chief of Naval Operations Adm. Mike Mullen, the commendation awarded was presented to all personnel permanently assigned to the Pacific Fleet headquarters staff and detachments from July 8, 2005 to May 7, 2007. 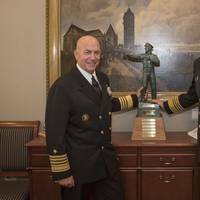 "This award is a testimony of the outstanding work by my predecessor Adm. Gary Roughead and everyone here on the Pacific Fleet staff," Willard said. Official U.S. Navy file photo of the guided missile destroyer USS Bulkeley (DDG 84). 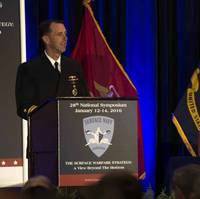 Chief of Naval Operations Adm. Mike Mullen announced the guided-missile destroyer USS Bulkeley (DDG 84) as the winner of the calendar year 2005 and 2006 USS Arizona Memorial Trophy Winner in a message delivered to the fleet July 12. Established in 1995, the award is presented to the ship demonstrating the greatest combat readiness in strike warfare, surface-fire support, anti-terrorism and force protection, and anti-surface warfare during a two-year competitive cycle. “The Arizona Trophy is a real source of pride for us, especially when viewed against the overall level of incredible readiness throughout the fleet,” said Cmdr. John Beaver, Bulkeley’s commanding officer. A crew member of the Royal Thai Navy Ship HTMS Similan (187) renders a bugle salute to the guided-missile frigate USS Jarrett (FFG 33) as it arrives in port for the Thailand phase of exercise Cooperation Afloat Readiness and Training. CARAT is a regularly scheduled series of bilateral military training exercises with several Southeast Asia nations designed to enhance interoperability of the respective sea services. U.S. Navy photo by Mass Communication Specialist 1st Class Thomas J. By Lt. When Chief of Naval Operations Adm. Mike Mullen put forth the bold concept of a '1,000-ship navy,' he envisioned the U.S. and other navies worldwide joining in regional partnerships to improve maritime security and the sharing of information. By Mass Communication Specialist 2nd Class Barry R. Hirayama, Fleet Public Affairs Center, Det. Chief of Naval Operations (CNO) Adm. Mike Mullen conducted an all hands call for forward-deployed Sailors aboard Fleet Activities Yokosuka on June 19. Hundreds of Sailors from the region came to the base’s Fleet Theater to hear CNO talk about today’s Navy and the importance of developing strong leadership for the future. Mullen spoke about his recent attendance at the Naval Academy’s graduation and said that somewhere in that crowd or somewhere in an ROTC unit is the future CNO. “We’ve got to get the base right,” Mullen emphasized. “How can you reach in and lead, so we can continue to be a very robust system?” Mullen asked. Vice Adm. Jeffrey L. Fowler relieved Vice Adm. Rodney P. Rempt as Superintendent of the United States Naval Academy during a change of command ceremony held in Alumni Hall on June 8. Chief of Naval Operations Adm. Mike Mullen praised Remptâ€™s accomplishments during his four years at the Naval Academy, commending his focus on developing midshipmen as combat leaders of character. â€œAs a Naval Academy grad, I want to thank you for all that you have done for my alma mater, the naval services, and the nation,â€ Mullen said. Rempt, a surface warfare officer and a 1966 graduate of the U.S. Naval Academy, became the 59th superintendent of the U.S. Naval Academy in August 2003. â€œI am eternally indebted to the finest faculty in the country,â€ said Rempt. Defense Secretary Robert M. Gates announced June 8 that he will recommend that President Bush nominate Chief of Naval Operations Adm. Mike Mullen to replace Marine Gen. Peter Pace as chairman of the Joint Chiefs of Staff. In a Pentagon news conference, Gates said he also will recommend Marine Gen. James E. Cartwright for the position of vice chairman. Cartwright is the commander of U.S. Strategic Command. Navy Adm. Edmund P. Giambastiani Jr., the current vice chairman, announced his decision to retire last week. â€œI have become well acquainted with Admiral Mullen over the last six months and believe he has the strategic insight, experience and integrity to lead Americaâ€™s armed forces,â€ Gates said. Adm. Robert F. Willard, former Vice Chief of Naval Operations, salutes as heâ€™s piped through the sideboys during a change of command ceremony for Commander, U.S. Pacific Fleet on board Naval Station Pearl Harbor. Willard assumed command of U.S. Pacific Fleet from Adm. Gary Roughead during the ceremony. U.S. Navy photo by Mass Communication Specialist 1st Class James E. From U.S. Adm. Robert F. Willard relieved Adm. Gary Roughead as commander of U.S. Pacific Fleet during a change of command ceremony held May 8 at Naval Station Pearl Harbor. Chief of Naval Operations (CNO) Adm. Mike Mullen presided over the ceremony, which overlooked the historic memorials of USS Arizona and USS Missouri. Chief of Naval Operations (CNO) Adm. Mike Mullen visits with side boys after being piped aboard USS Monterey (CG 61) at Naval Station Norfolk. Mullen was joined by Master Chief Petty Officer of the Navy (MCPON) Joe R. Campa Jr. Together, they visited USS Wasp (LHD 1) and held two all hands calls at the base theater. U.S. Navy photo by Mass Communication Specialist 1st Class Chad J. Chief of Naval Operations (CNO) Adm. Michael G. Mullen, accompanied by Master Chief Petty Officer of the Navy (SW/FMF) Joe R. Campa Jr., addressed approximately 350 Sailors aboard USS Monterey (CG 61) on May 1. Monterey recently returned to Norfolk after six months of operating in the North Atlantic and Mediterranean Sea.